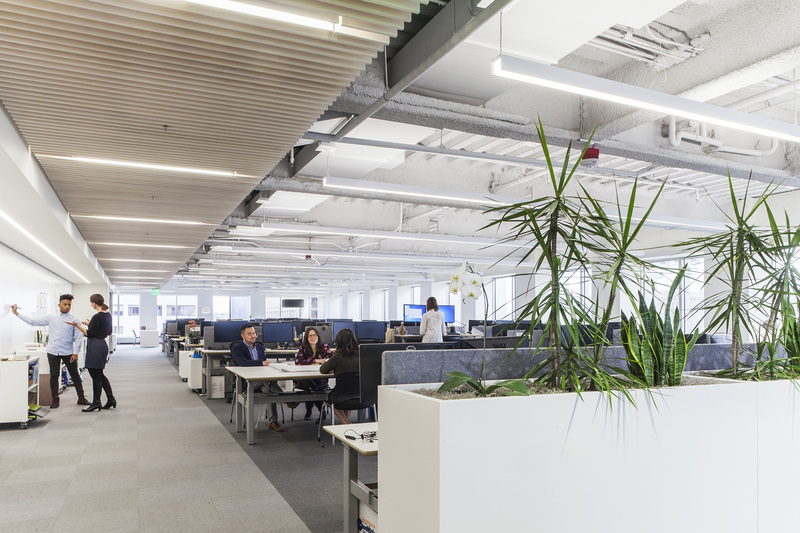 Challenge: Create a beautiful, functional open office environment at the firm’s new Seattle location that allows for expansion and flexibility. In a smart move, the design for Perkins Will's new Seattle workspace was handed off to the Vancouver team to bring a little outside objectivity and to keep the project moving forward. 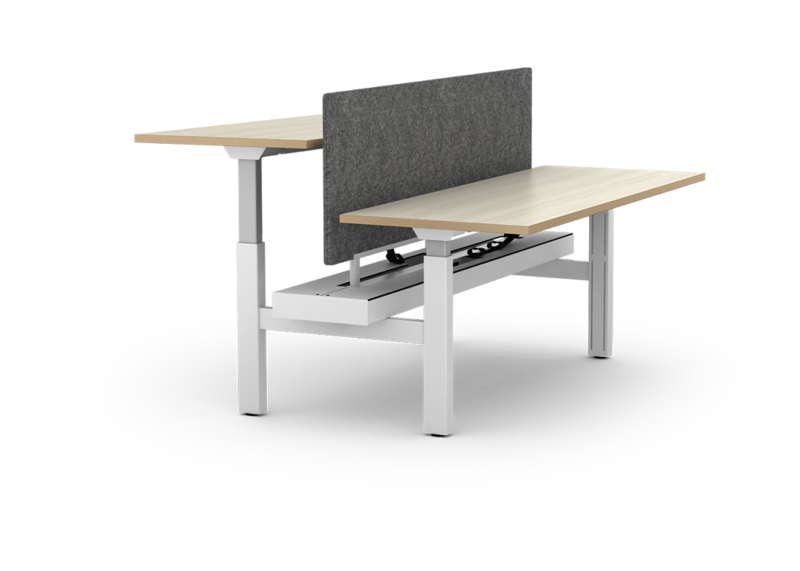 Individual flexibility – height-adjustable benches let the team move from sit to stand throughout the day to keep the creative juices flowing and promote well being. Team flexibility – benches were installed in packs of eight with six workstations and two conference ends that could easily be reconfigured or added to. Tailored storage – credenzas were designed and built specifically for Perkins+Will to display and store plans and other creative essentials. Power and data – all wiring is stored out of site in a raceway that opens from the top for easy access. Sleek, uniform privacy – integral fixed-height privacy screens in shades of grey provide a unified, refined look. Perkins+Will wanted to keep their look open, clean and simple--and that meant their storage had to work extra hard. The project team worked with designers at Watson to engineer the perfect credenza. After several iterations and three working prototypes a design was nailed that beautifully displays and stores plans and other essentials for the creative team. 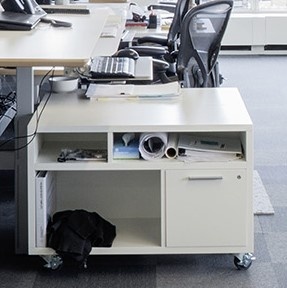 Putting the credenza on casters added mobility and flexibility to their tailored solution. The Perkins+Will team chose a unifying white color for their Seven-line furniture and a distinctive knife-edge profile left clear to reveal the natural beauty of the quality substrate. With Watson benching, the team achieved the looks, adjustability and quality they wanted without the bulk and heaviness apparent in other manufacturers’ lines. Thoughtful design and practicality also extend to how the furniture is installed. Designed to be easy on installers’ backs and on the client’s budget, Watson benches are assembled from the bottom up and install in about the third of the time of comparable benching systems. 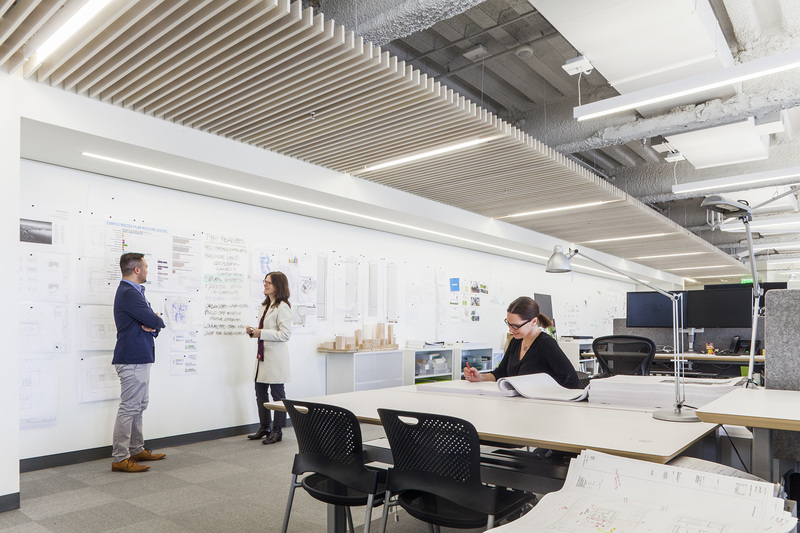 Working together the project team delivered an office solution whose beauty, functionality and flexibility will help Perkins+Will attract and retain the best creative talent, and adapt as their business grows and changes. In fact, the company continues to grow and add more workstations to their initial delivery of 108. Moreover, the timeless design combined with the robust quality and craftsmanship that’s uniquely Watson, means that the firm’s office solution will look beautiful and provide service for years to come.